Can I view upcoming contact birthdays? There are multiple ways to see upcoming contact birthdays. On the Dashboard you can see "Upcoming special dates" for your contacts which includes Birthdays, Anniversaries and Client Since dates you are tracking. On the calendar, you can check the "Special Dates" box to see all special dates you are tracking. The "Daily Digest" email notification which goes out daily will also remind you of birthdays on the current day. 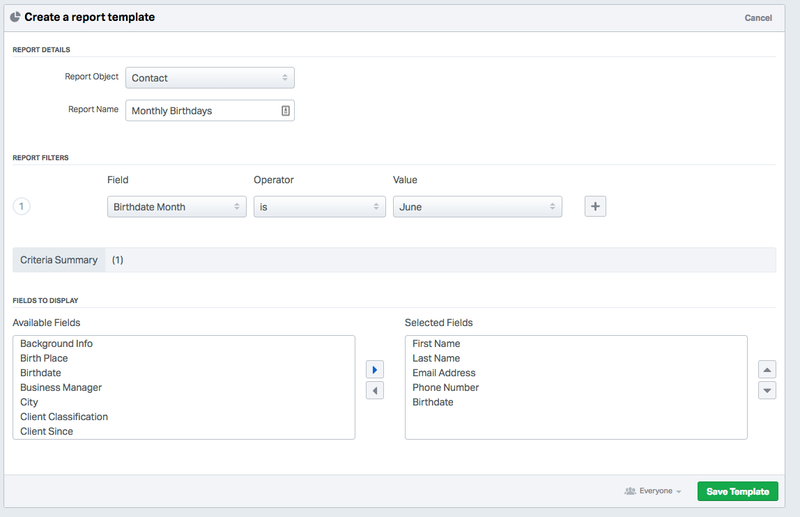 The Reports module includes a "Birthdays in the next 60 days" report in the Sample Reports which can be customized. You could also save your own report to see all birthdays within a specific Month.